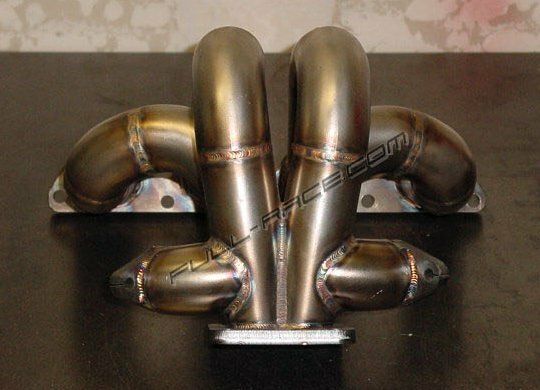 B/H ProSeries Race Turbo manifold dual WG. The ProRace dual wastegate manifold is a must for those with a track only race setup. - The merge collector creates a turblent free area for the exhaust gasses to enter the turbine housing in even pulses at high velocities. This allows the turbo to spool faster than most turbo manifolds on the market. Unlike other turbo manifolds, the merge collector is welded inside and out which further prevents cracking. - 8 gauge forged stainless steel. - Air to water intercooler compatible only. Flanged for T4 turbos, and any wastegate you choose. Runners flow ~280 CFM individually.